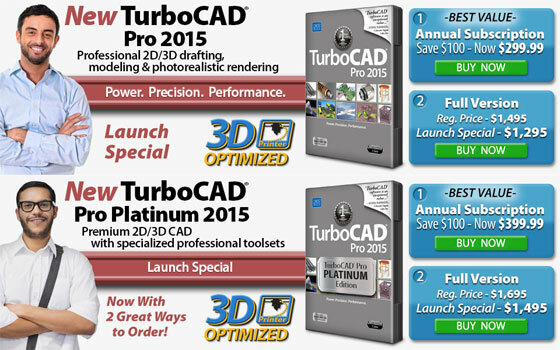 IMSI/Design LLC just introduced the 2015 range of its flagship cad products TurboCAD Pro and TurboCAD Pro Platinum. These newest cad products will be useful for AEC professionals as well as 3d modeling, mechanical design engineering, multifunctional drafting. Some significant advancements are made to rendering, visualization and detailing. There are also some crucial improvements with productivity & applicability and enhanced interoperability attributes. TurboCAD Pro contains the series of some professional-level tools which can be applied for designing, adjusting, delivering and documenting of 2D and 3D designs in a consolidated manner. TurboCAD Pro Platinum speed ups the functionality of TurboCAD Pro for 2D/3D drafting, detailing, modeling, rendering and file sharing through some sophisticated tools for having superior control and resiliency. TurboCAD Pro 2015 facilitates high-end 3D modeling and mechanical design as it wraps a wire just about a 3D solid to be applied as an extrusion or sweep path. There is also a quick pool tool that provides several selection standards to manage numerous co-planar faces together. With quick pull tools the users can solidify ACIS surfaces as well as dynamically toggle between Quick Pull and Imprint modes. The users can also produce a surface out of faces and generate a surface from a solid. Drafting and detailing processes are also improved significantly in version 2015 with the inclusion better dimension text and sorted layers in drop-down lists. With the Trim tools, the users can trim hatched or closed objects as well as retain the hatch or closure. Besides, the Join Polyline tool now supports Beziers and splines devoid of transforming to a polyline by keeping original curve status intact. TurboCAD Pro Platinum consists of UV mapping, a method utilized to “wrap” a 2D image texture onto a 3D mesh. It also offers a materials editor, library of materials, lighting and luminances to characterize precise photorealistic presentations in real time. With elementary BIM functionalities of TurboCAD Pro Platinum 2015, the AEC professionals will be able to import intelligent walls, doors, windows, slabs and roofs saved in the Industry Foundation Classes (IFC) format. Besides, there are new slab roof object types and mitering of roof slabs. Get complete details of TurboCAD Pro 2015 and TurboCAD Pro Platinum. Download a free 30-day trial version.